Living a Fit and Full Life: Dr. Seuss' The Grinch Available on MOVIES ANYWHERE, 4K Ultra HD, 3D Blu-ray™, Blu-ray™, DVD and On Demand! Dr. Seuss' The Grinch Available on MOVIES ANYWHERE, 4K Ultra HD, 3D Blu-ray™, Blu-ray™, DVD and On Demand! 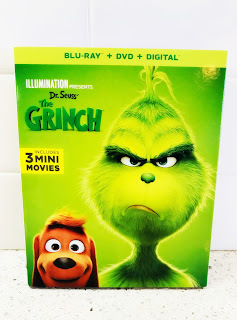 From Illumination and Universal Pictures Home Entertainment, the film based on Dr. Seuss' beloved tale about a cynical grouch who goes on a mission to steal Christmas from others only to feel his own heart grow three sizes larger through unexpected friendships is one "the whole family can watch and enjoy," (Kidsday/Newsday). 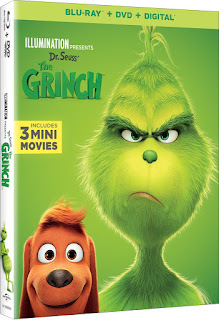 The new home entertainment edition contains more than 60 minutes of bonus content, including three mini-movies: "Dog Days of Winter" starring the Grinch and his heroically loyal dog Max; and "Yellow is the New Black" and "Santa's Little Helpers," both starring the lovable Minions. It also includes stunning featurettes, a how-to-draw tutorial and much more. Narrated by Grammy Award® winner and Oscar® nominee Pharrell Williams, Dr. Seuss' The Grinch stars Academy Award® nominee Benedict Cumberbatch (Dr. Strange, "Sherlock") as the infamous Grinch, who lives a solitary life inside a cave on Mt. Crumpit with only his loyal dog, Max, for company. The incredible voice cast includes Rashida Jones ("Parks and Recreation," The Muppets) as Donna Who, Kenan Thompson ("Saturday Night Live") as Bricklebaum, Cameron Seely (The Greatest Showman) as Cindy-Lou Who, and featuring legendary actress Angela Lansbury (Anastasia, Beauty and the Beast) as the mayor of Whoville. Funny, heartwarming and visually stunning, Dr. Seuss' The Grinch is a perfect night in for the whole family! Dr. Seuss' The Grinch is such a fun movie for both kids and adults! It's film based on Dr. Seuss' beloved tale about a cynical grouch who goes on a mission to steal Christmas from others only to feel his own heart grow three sizes larger through unexpected friendships. I have four kids, age three to eleven that all absolutely enjoyed this move. The characters are such a hoot and the message is terrific. It's a wonderful movie that the whole family can enjoy time and time again. Dr. Seuss' The Grinch is a terrific movie for the holidays and beyond! Click HERE to learn more about Dr. Seuss' The Grinch! Follow Dr. Seuss' The Grinch on social media!